How much time should be spent making a decision? We make decisions everyday. What to eat. What to wear. When to go to sleep. When to go to work. Some of those decisions are so simple, we make them without even thinking about it. But what about those life-changing, make-or-break decisions that require much thought and deliberation? How much time should be spent with those? How much thought? There’s no right answer to this question because every major decision is different. 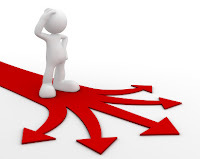 There are, however, factors that one can consider when making a high-stakes decision. We’re not saying you should go back and forth on the decision over and over again. And we’re not saying you should take all the time in the world to make it. Decisions need to be made. What we are saying, and what expert Sydney Finkelstein, co-author of the book “Why Good Leaders Make Bad Decisions has said is, “When there's more at stake, you have to take more time [but] how much time really depends on the magnitude of the decision.” The point is, don’t make it too fast. While you are the only one who can actually make the decision, it’s totally ok to ask others for their opinion on the matter. Ask friends and family, look at the different outcomes you are presented, and see which one works best for you. Remember that despite the varying opinions, you’ll need to trust yourself about the outcome. You’re the one who will be held accountable. While decisions may seem unwavering and final, they never actually are. A recent article in the Harvard Business Review by Amy Gallo said, “Your decision will not be perfect.” And rightfully so. Just because a decision is made does not be an issue is solved. But it doesn’t mean one is stuck with the decision or the issue either. It’s best to look at the situation over and over and see where you stand once time has passed.